It's that time of year again! Apple's World Wide Developers Conference is just around the corner, and there are a lot of things we are expecting to see unveiled by Apple next week. From software like iOS 11 and MacOS 10.13, to brand new hardware like the speculated Siri smart speaker, we can't wait to see what Apple has in store. You can take it to the bank that we will be seeing the next version of iOS unveiled at this years conference, most likely to be called iOS11. We aren't exactly sure what we'll be seeing in this update, but expectations include improvements to Siri, some Apple Music refinements and even some possible visual design changes throughout the system. As well as this, there have been rumours circulating that Apple's video calling service Facetime could finally receive an update enabling group conversations! I wouldn't go expecting anything like the amount of changes and improvements we saw in 2013 with the introduction of iOS 7, but you may be pleasantly surprised at what appears on you phone later this year. Another given is that we will be seeing updates to Apple's Mac platform, recently renamed to MacOS. We haven't heard much at all about what will make it into this update, but we wouldn't be surprised to see improvements to general performance, expanded Handoff functionality and Siri expansion. There has also been rumours about "Apple Music" splitting off from the more general iTunes music player, so we might see something interesting on that front as well. Probably the most exciting rumour this year, as well as the one with a lot of credibility, is the expected announcement of an Apple smart speaker. This would be a direct competitor to products like the Amazon echo and Google Home, but would likely be deeply integrated with Apple's HomeKit services as well as Siri. Apple SVP of marketing Phil Schiller was recently quoted critiquing the lack of screens on competitor products, raising expectations that Apple's implementation may include a built in screen. Other rumours suggest however that the design might be more similar to that of the MacPro, with its sleek, black cylindrical body. Regardless of what it looks like, you can expect to be paying a hefty Apple tax on this one, so best start saving now. There will likely be heaps more seen at the keynote this year. Here are a few honourable mentions that should attract some attention during the presentation. 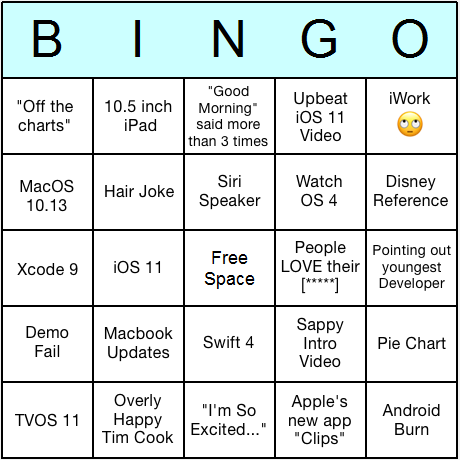 If you're so excited about this years conference that you want to watch it live, why not have a bit of fun while you do so and check out our WWDC bingo card!